Arrecife Airport is the island’s only airport with flights to over 60 destinations in 20 countries throughout Spain and Europe. There are almost 20 flights just to the UK! The Irish have been fans of Lanzarote for many years and there are frequent flights from both the the Republic and Northern Ireland. Departures traffic is divided between T1 (domestic and international flights) and T2 (inter-island flights). In T1 the departures area is on the first floor. There are forty-two standard check-in desks in total and one for special baggage. In this area you can also find Airport’s information service, a chemist’s and a lottery shop. T2 has 6 check-in desks and 5 boarding gates (P1, P2, P3, P4 and P5). In the departures area there is also a Binter ticket sales counter, an Aena information point, a multi-shop and a cafeteria. Arrivals are divided between T1 (domestic and international flights) and T2 (inter-island flights). The arrivals area in T1 is located on the ground floor of the terminal. It has six standard baggage reclaim carousels and one for special baggage. The customer service desks of the handling and car hire companies are also located in this area. In the public area there is a cafeteria, cash machines, the offices of the tour operators and an office of the Lanzarote island council where you can find tourist information. In Arrivals in T2 there is a baggage reclaim carousel, a lost property office, several car hire companies, a cafeteria, and a multi-shop. 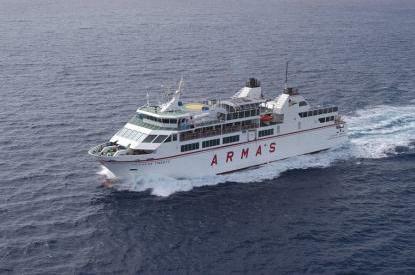 The three main ferry companies are Fred.Olsen Express Lineas Romero and Naviera Armas. Lineas Romero sail to La Graciosa as well as Fuerteventura. Romero used to have a significant price advantage over the other two, but the bigger operators sometimes have special offers running across all Canarian routes so it is worth checking all of them. It is possible to sail to most of the other Canary Islands but I regret the fares are “disappointing” to be polite! Look out for special offers on all routes! Naviera Armas also sail to Huelva in Andalucía. As for the weekly route to Cádiz in Andalucía, Spain you may be interested in this account. Intercitybus is the main bus company serving the island with modern, air-conditioned buses which are prompt and efficient. Most of the island is connected. Intercity also run the local Route in and around Playa Blanca on a 30 minute schedule. A second company runs four routes within Arrecife and what I have shown is the totality of information about them. Fuerteventura Transportes is the Fuerteventura equivalent of Intercity buses and may be of interest if going to the neighbouring island. Incidentally buses are known locally as las guaguas although you will be understood if you use the castellano autobús and probably even bus, buss etc!